Environmental DNA (eDNA) is an increasingly used non-invasive molecular tool for detecting species presence and monitoring populations. 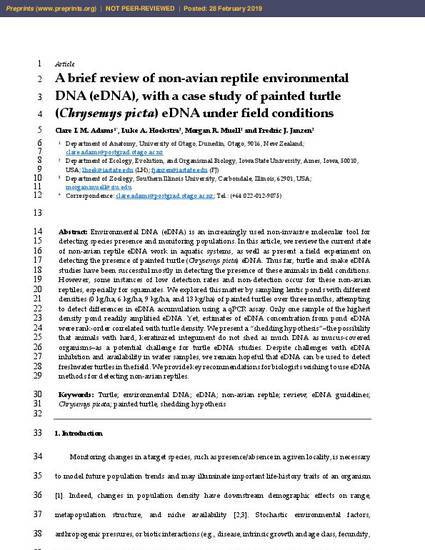 In this article, we review the current state of non-avian reptile eDNA work in aquatic systems, as well as present a field experiment on detecting the presence of painted turtle (Chrysemys picta) eDNA. Thus far, turtle and snake eDNA studies have been successful mostly in detecting the presence of these animals in field conditions. However, some instances of low detection rates and non-detection occur for these non-avian reptiles, especially for squamates. We explored this matter by sampling lentic ponds with different densities (0 kg/ha, 6 kg/ha, 9 kg/ha, and 13 kg/ha) of painted turtles over three months, attempting to detect differences in eDNA accumulation using a qPCR assay. Only one sample of the highest density pond readily amplified eDNA. Yet, estimates of eDNA concentration from pond eDNA were rank-order correlated with turtle density. We present a “shedding hypothesis”–the possibility that animals with hard, keratinized integument do not shed as much DNA as mucus-covered organisms–as a potential challenge for turtle eDNA studies. Despite challenges with eDNA inhibition and availability in water samples, we remain hopeful that eDNA can be used to detect freshwater turtles in the field. We provide key recommendations for biologists wishing to use eDNA methods for detecting non-avian reptiles. This is a preprint made available through Preprints: https://www.preprints.org/manuscript/201902.0261/v1.